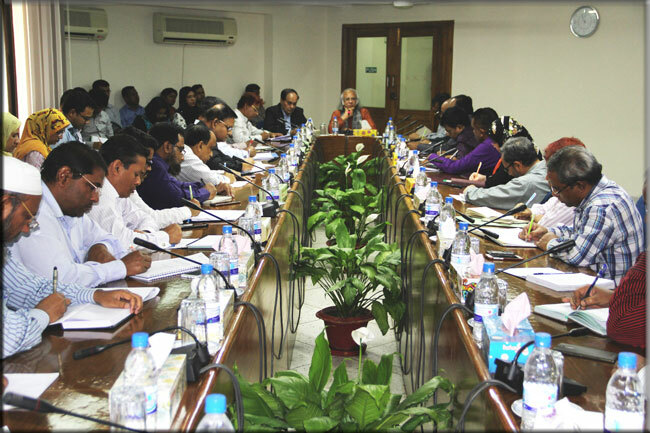 Following the country’s remarkable progress in achieving the Millennium Development Goals (MDGs), Dr. Qazi Kholiquzzaman Ahmad, Chairman, PKSF delivered a knowledge disseminating lecture in a meeting with a good number of PKSF officials on various critical development issues to be pertinent for the implementation of Sustainable Development Goals (SDGs) in Bangladesh. In his lecture, arranged on March 16, 2017 in PKSF Bhaban, Dr. Ahmad shared his experiences and thoughts with PKSF officials by putting forward some of the basic socio-economic development issues of Bangladesh in the context of its macro and meso-economy. Besides, this lecture has referred some future directives for PKSF to carry out the responsibility in response to the government’s initiatives for SDGs implementation in the days ahead. Mr. Md. Abdul Karim, Managing Director, PKSF delivered a concluding remark on this occasion and thanked Dr. Ahmad for his invaluable directions on SDGs’ implementation in Bangladesh. The lecture meeting ended with a lively discussion among the participants.